This new 5th edition was revised on the ground just months before publication. There are both restaurant and route changes. 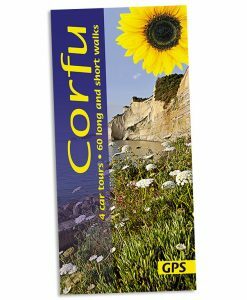 The maps have been redesigned with waypoints which correspond to coloured waypoints in the text, and free downloadable GPS tracks are now available for all the walks. The guide has become a classic on the island, with much of interest even for non-walkers. Or, purchase the complete book as a downloadable PDF using the Add to Basket button below (£7). 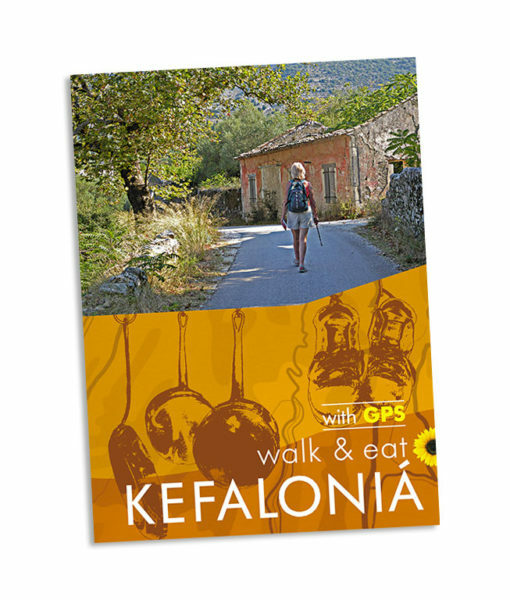 If holidays are about new experiences, then this pocket guide solves two problems — where to enjoy walking in Kefalonia and where to find some good, traditional food. There are strolls for hot days and longer walks to work up an appetite. 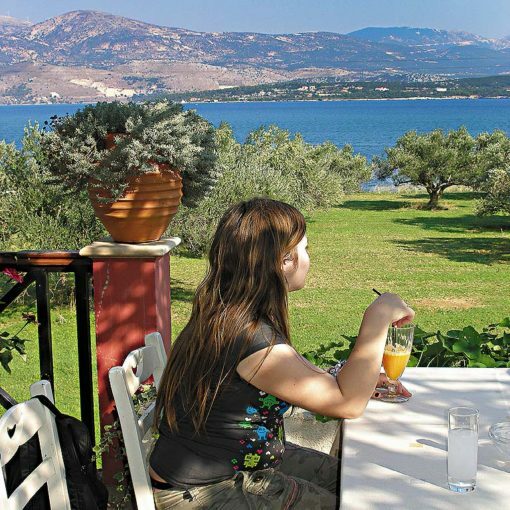 And if you‘re just after some recommendations for where to eat out in Kefalonia, you need look no further! For each suggested restaurant there is a photograph of the décor and one of their dishes, plus sample menu, price guide, opening times, and a recipe for one of their specialities. Other sections include: planning your trip, logistics on arrival, shopping for self-catering (including health food shops), local markets and specialities, glossary of local food terms, etc. A special feature is the emphasis on natural local foods suitable for those with food intolerances. All recipes have been made by the authors and are known to ‘work’. 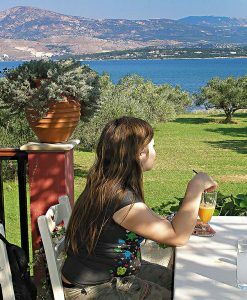 For an extremely useful source of information about the island, go to http://www.greekisland.co.uk and choose Kefalonia. Area covered: The walks are spread all around the island and there is at least one near every major resort. There isn’t much information available for walking on the island, and this book brings together ten of Kefalonia’s best walks. The best months for walking in Kefalonia are from early April to end May and late September till October. Your choice of where to look for accommodation will be governed by several factors. For instance, if you intend to hire a car you will benefit from a much wider choice. On the other hand if you plan to rely on public transport, you will need to choose a centre offering good access to the walk routes or excursions you plan to do. There is also the factor of what type of accommodation you plan to use, for example whether you plan to stay in a hotel or in a self-catering apartment or villa. The author provides useful advice on the various options in the Where to Stay chapter which will be found in the introductory pages of the book. The following is the index of places; the book also contains an index of recipes (which is not shown here). Page numbers shown in bold are where photographs appear; those shown in italics are where maps appear. A NEW EDITION WILL BE PUBLISHED SPRING 2019. 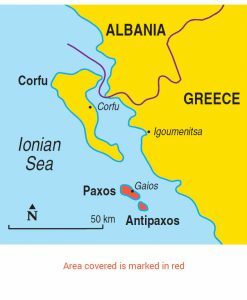 1) The email address given in the current Kefalonia guide on page 144 is incorrect. It reads mail@sunflowerbooks.co.uk but should be info@sunflowerbooks.co.uk. 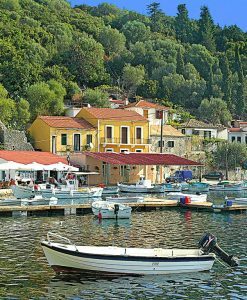 Walk 5: The cover photograph mentioned on page 78 is not Assos Bay but the lagoon at Argostoli. Below are some readers’ suggestions for other walks. 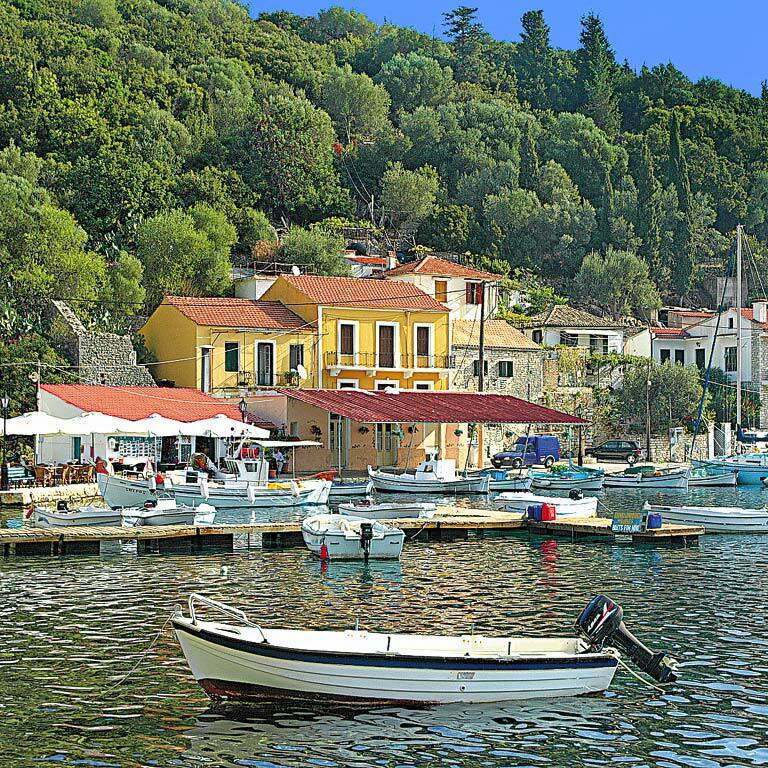 Other walks from Skala: Here are a few walk suggestions: Walk from Skala to Poros 15k allow 3-4 hours. Recommended in May for flowers and butterflies. Follow walk 10 to Old Skala church and continue on the road to skirt the valley on your left. The road bends around the head of the valley and at a staggered junction turn right and right again. Follow signs to the delightfully named Fanies and Asprogerakas. There is also a handwritten sign to Poros. Keep ahead ignoring all turns off to the right through Fanies where the road turns to a track. As you approach Asprogerakas (no signage) the track bends left then right and at a junction of tracks take the right fork towards the large new Church. Note, if you head left uphill and around a small holding the track will join up with walk 8 from Ag Georgios at a ‘v’ junction. Carry on straight ahead for 10mins if you want a view over the valley, Tzanata and towards walk 9. Return the same way and take the left fork at the v junction which brings you to Asprogerakas and the Church. Which ever you choose, at the church you are on walk 08 with the junction of the track to Aninata behind it (waymarked). 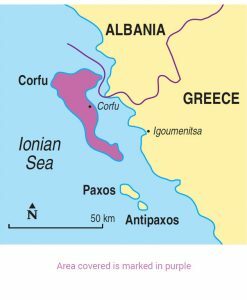 Follow contour track or divert via Ananata, the tracks join up at Ag Paraskevi. To descend take right fork downhill, about 1k out of Poros there is a drinking water fountain on the left. If you cannot make the extra 50m in Poros to the Sunset tavern, the Agropidas tavern just before it is traditional and friendly. To return either walk along main road (11k) the road is not too busy and wide enough but it is a bit of a slog, or taxi, or bus or boat taxi if either are running. 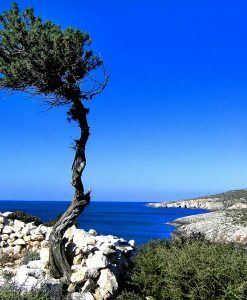 + To Mounda Bay and back: Follow walk to Old Skala past water tanks and left t the junction. Ascend a couple of hairpins. On a straight uphill stretch fork left on a concrete track. There is a green sign to Turtle Beach put up by a villa company. Follow this track straight on ignoring where the track turns right and continue on a rough track through fields. Cross a stream bed and when you come to T junction turn right and behind a large modern building and come out on the main road directly opposite the road down to Mounda Beach. There is a hotel bar, restaurant and shop on the beach and a tavern further round. There is about 4k of beach to walk if you want and with a bit of scrabbling you can walk to Katelios but annoyingly the headland to get back to Skala is not quite accessible. To return, either reverse your outbound route or at the main road turn right and walk along the main road for 600metres. Turn left at a track on the apex of a right hand bend. At a right fork carry straight on, then ignore track to left as the track bends to the right. Follow the track and at a junction where there is a tarmac road going right either turn up to join road or carry straight on (under the water tanks) to join your route out just after the junction on walk 10. 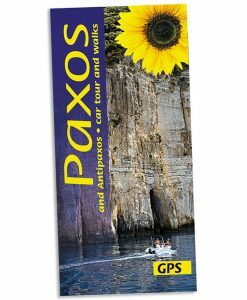 + Skala Loop: Follow walk to Old Skala and turn right uphill past the Taverna, (lots of villa signs) follow contouring track past amphitheatre for 4k to where it descends to join the main road about 3k north of Skala. 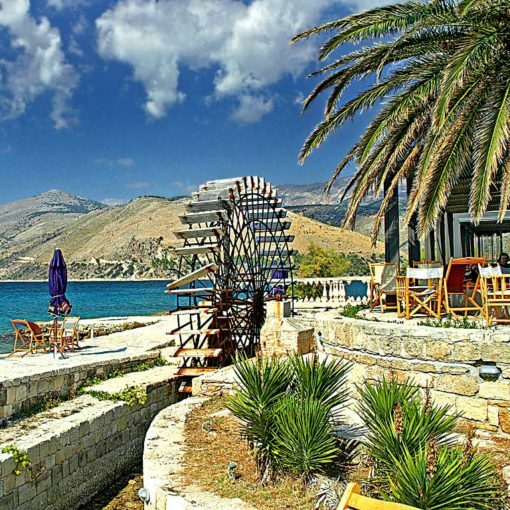 + Walk across Island from Ag Efimia to Myrtos Bay 7.5k or 15k there and back allow 4-5 hours. This is a waymarked track with which runs alongside the main road but beware it is rough and stony underfoot. There are information boards at both ends.. Waymarking is by yellow signs and red squares. Start at Ag Efimia in the harbour by the bus/taxi rank and follow yellow sign behind a no entry sign. At 28th October Square fork right onto a track (sign hidden in a large olive tree on right). Follow the obvious track, at a sign to main road fork slightly left to keep off the road. After about 30 minutes by a derelict tavern the sign appears to point off the track down though undergrowth. You can go this way as it leads to some steps, or carry on the track (red triangle marker) and then in 100 yds turn right. Either way, cross the main road and pick up the track on the other side (yellow sign). The track crosses a couple of tarmac roads and at about 1hr 30 mins it bends right uphill to the Well of Strifti. Turn sharp left up a steep concrete drive to a road. Turn left and follow the road as it bends right, in a few minutes at a T junction turn left downhill between houses. You come out at the village square in Divarata, turn left and downhill to Myrtos. 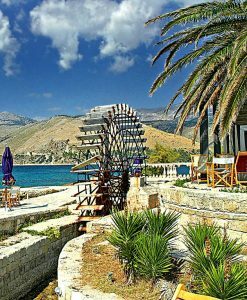 There is a kiosk and tavernas in Divarata. The walk down to Myrtos takes about 25 minutes and about 35 coming back, it is not quite as bad as it seems. There is a tavern on the beach in high season. An option would be to drive to Divarata so you can use the car to go up and down to Myrtos and then walk the route in reverse to Ag Efimia where there are a number of tavernas, supermarkets and gelateria/patisseria and then back – just over 3 hour round trip not including drive to Myrtos. 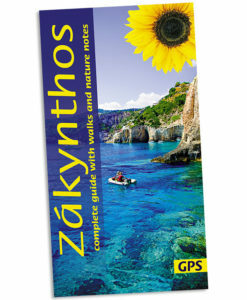 Short Circular Walk from Karavomilos: Karavomilos Lake (picture on page 74) is northwest of Sami.